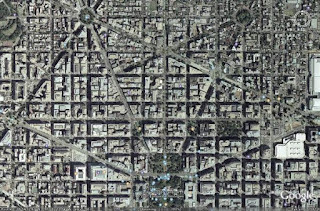 Some observations about the infamous "D.C. Pentagram"
The DC pentagram has attracted the attention of conspiracy theorists claiming it is further proof of a Freemasonic and/or Satanic conspiracy within the U.S. Government. Laws of Silence does not subscribe to these theories, but as it has an interest in the apparent intersection of occult imagery and politics, further investigation was made. True enough, the pentagram is defined by points which have at least some Masonic connection. Make of that what you will. Dupont and Logan Circles form the two leg-points of the pentagram. 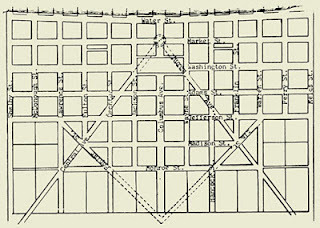 The lines are traced up 15th St. and Connecticut Avenue where they are broken at K St. by Farragut and McPherson Squares. The lines pick back up but are broken again at LaFayette Park. The two lines, if continued, form the tip of the star--which on a North-oriented map is inverted--at the center of the White House. K St. forms the bar of the pentagram and culminates at Washington Circle and Mt. Vernon Square. From Mt. Vernon the line rejoins Dupont Circle via Massachussetts Avenue. The star is incomplete. From Logan Circle, Rhode Island Ave. seeks to complete the pentagram, but it stops, leaving the left arm incomplete from where RI meets Connecticut (connect it cut?) until Washington Circle. Incidentally, Penn. 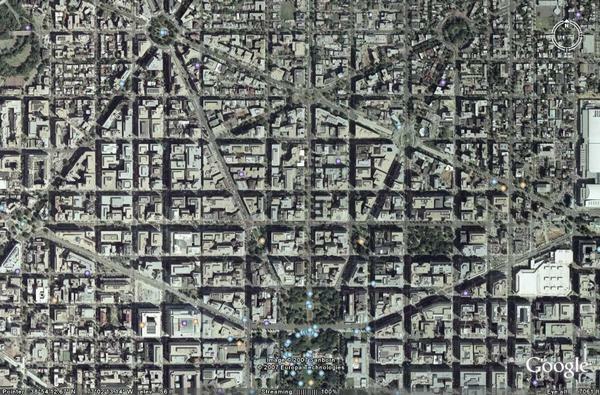 Ave., New Hampshire Ave, New York Ave. and P St. form a near perfect pentagon around the star, but from Logan to Mt. Vernon, the opposite of the broken arm, it is unfinished. Where 16th St.--which bisects the pentagram right down the middle--meets P St.--the base of the Pentagon--there is a Masonic Temple which serves as the HQ of the Southern Jurisdiction of the Scottish Rite. 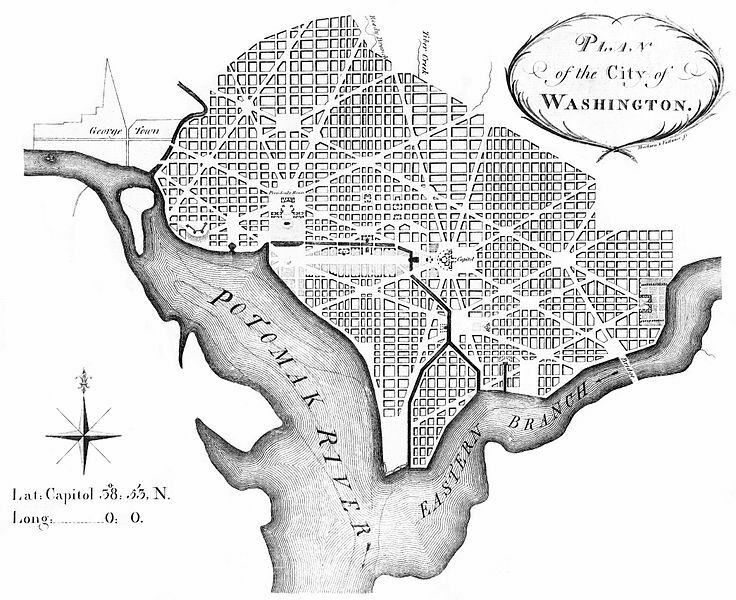 Washington Circle is bisected by 23rd St. General George Washinton was an active Freemason. Mt. Vernon Square rests just north of I (Eye) St. (The "Eye" is included on maps of DC) Mt. Vernon was Washington's home. David G. Farragut (First Admiral of the Navy) and the Marquis de LaFayette were also Freemasons. Logan Circle is Bisected by 13th St. General John A. Logan, a Civil War hero, was made a Mason in Benton Lodge No. 64, Illinois. Lieutenant General Winfield Scott, whose circle lies at the crotch of the pentagram was not only a Freemason, but was invited to Cuba by a group of Freemasons, inspired by the events of 1848, to lead an insurrection against the Spanish. Scott died in 1849 before the plot could be carried out, shortly after having been transferred to Texas. Rear Admiral Samuel Francis DuPont came from a family of wealth, power and Freemasonic and (allegedly) Illuminist connections. 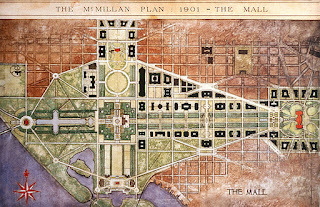 The DuPont family had a prominent role in building DC. Was Major Brigadier General James Birdseye McPherson a Freemason? 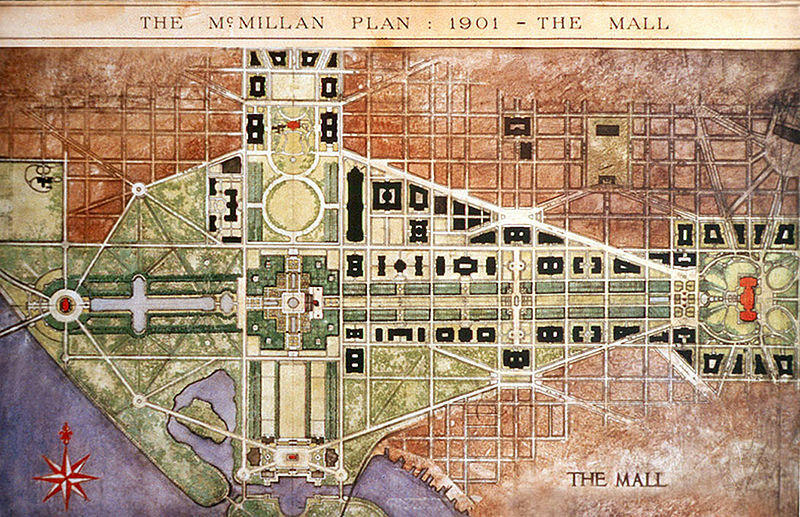 (Top) A beautiful drawing of the National Mall from the McMillan Plan (1901), said by many to be based upon the Sephiroth, or Kabbalistic Tree of Life. 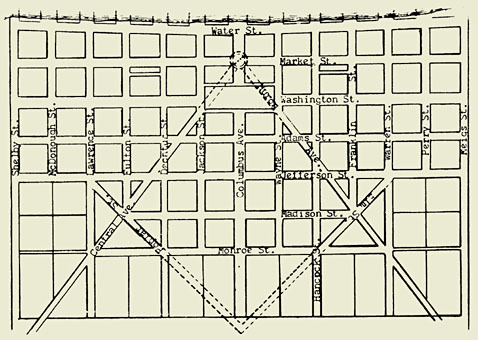 (Bottom) Pierre L'Enfant drew his "Plan of the City of Washington," between March 1791 and February 1792. Although many websites claim L'Enfant was a Freemason, there is no evidence to that effect. Today, the square and compasses are barely visible, as this contemporary map demonstrates. Unlike the D.C. Pentagram, it doesn't really jump out at the looker. With all the talk about the strange geometry of D.C., it's surprising this hasn't caught on yet. Philistines were = are Mexican & Latin reincarnated #Confirmed . 11:00 am pdt #07132018AD. Washington DC layout is a target of my Orionite Space Teams. Why? Pentagon is full of Dragon Baalites. OK. It is personal, not you. They killed my mother . It is IAM revenge. 9:05 p.m. #07122018AD.